Social media posts reached more than 20,000 people, generating over 1,000 likes and comments. 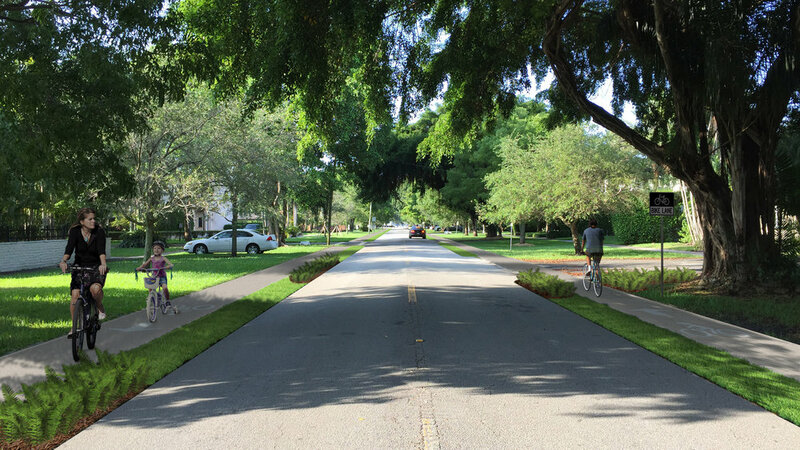 There were over 1,200 unique visitors to the Gables Greenways website. 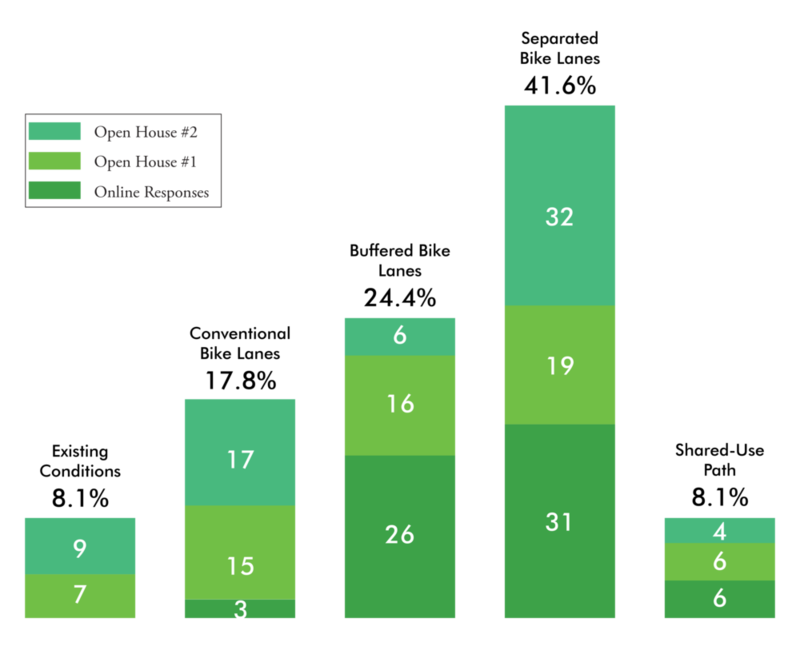 Mailers were sent to more than 590 households along the Greenways. Flyers were handed to more than 100 businesses along the Greenways. 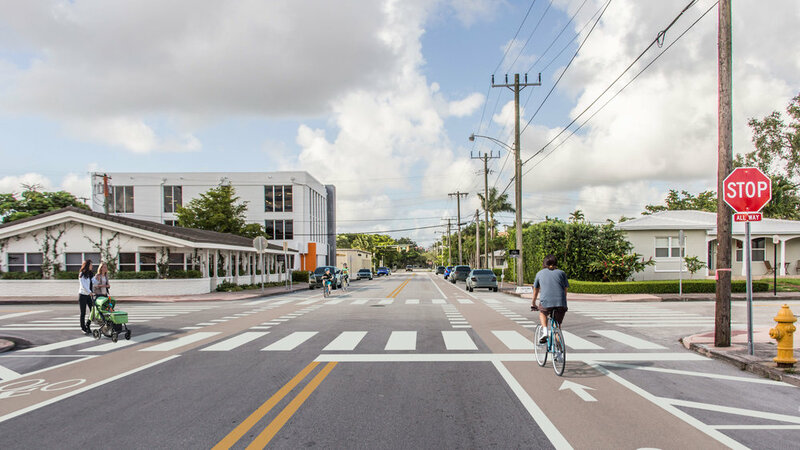 Articles were included in The Miami Herald, Coral Gables E-News, Commissioner Mena's Newsletter, Commissioner Lago's Newsletter, Bike Walk Coral Gables' Newsletter, The Underline's Newsletter, the Miami-Dade County Transportation Planning Organization's Newsletter, and The Miami Bike Scene. 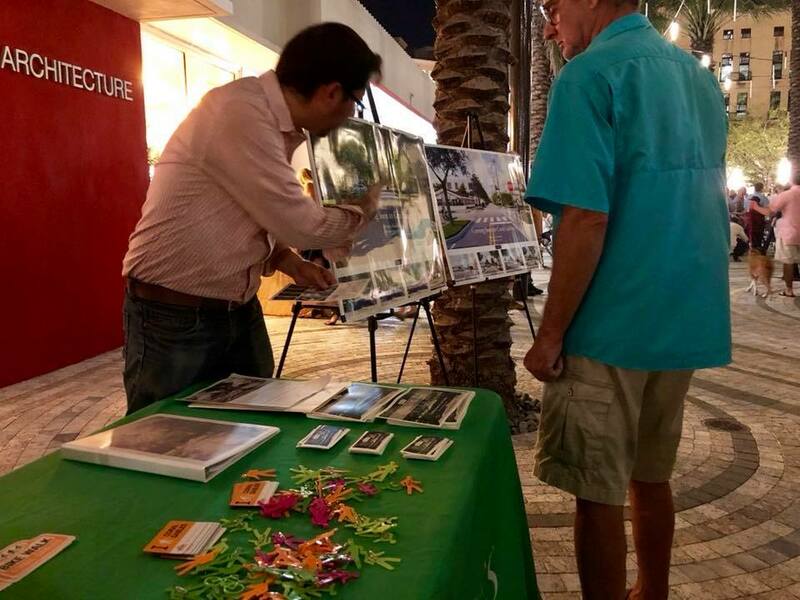 Over 150 people visited the Gables Greenways table at the Giralda Plaza Grand Opening Celebration. Over 60 people attended the October 18 Open House at the Coral Gables Library. Over 40 people attended the September 28 Open House at the Coral Gables Museum. 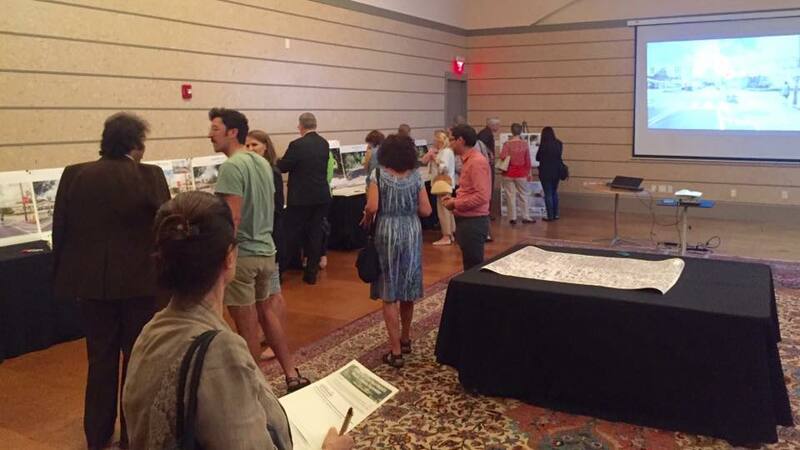 More than 50 people filled out the online survey at the Gables Greenways website. Over 50 people heard about the Gables Greenways at one of the monthly Gables Bike Tours. A summary of the feedback collected during this outreach effort is included below. Not approaching the project as a one size fits all solution, but being flexible depending on the particular section of roadway. Being better than nothing, and encouraging people to bike. Requiring only minimal road widening. Potentially being less expensive to build and maintain. Not being safe enough for children to ride. Not being comfortable enough to encourage more people to bike. Not doing enough to separate bikes and cars. Making the bike lanes a different color. Adding more trees and landscaping. Making the bike lanes as wide as possible. Enforcing speed limits and vehicles blocking the bike lanes. Keeping up with regular maintenance. Adding a rumble strip and/or reflectors. Narrowing the vehicular travel lanes. Having well marked crosswalks for bikes and pedestrians. Creating a targeted educational campaign. Having clear and visible markings. Making sure the bike lanes have smooth pavement. Having dedicated traffic lights for bikes. Allowing faster cyclists to pass slower bike riders. Requiring less maintenance than separated bike lanes. Providing more room for bicyclists to maneuver. Giving bicyclists more visual prominence than separated bike lanes or shared-use paths. Potentially being less expensive than separated bike lanes. Road widening potentially encouraging cars to drive faster. Road widening potentially having a negative impact on home values. Adding rumble strips and/or reflectors. Adding a physical barrier, like a curb or concrete planters to the buffer. Designing the buffer stripes to be artful. Adding a separate “walking” lane. Pairing with a Shared-Use Path. Being more convenient than a shared-use path. Encouraging more people to bike. Being more visible to drivers than a shared-use path. Looking like a sidewalk and thus encouraging conflicts with pedestrians. Making it more difficult to pass slower riders and maneuver around obstacles. Adding more landscaping to the buffer. Adding physical barriers such as a curb to the buffer. Keeping the bike lanes clear of debris. Having clear and visible crossings at intersections. Adding sidewalks where they are missing. Making the bike lane pavement smooth and even with the road. Lowering and enforcing speed limits. Adding lighting along the bike lanes. Stabilizing the soil in the buffer to prevent ruts. Painting the bike lane a different color. Being a benefit to pedestrians and joggers, not just bicyclists. Creating conflicts between bikes and pedestrians. Making it less convenient for bikes. Making it more difficult to maneuver around obstacles. Not being a type of facility that road cyclists will use. Creating potential conflicts with motorists backing out of driveways. Making the paths as wide as possible. Having clear signage and markings. Giving clear priority to the path at intersections. Adding landscaping along the paths. Adding lighting along the paths. Creating raised crossings at intersections. Enforcing no parking on paths. Maintaining smooth and even pavement on the paths. Maintaining paths clear of debris. Making the path visible at driveways and intersections. Making the paths a different color. Pairing with buffered bike lanes. Allowing faster cyclists to pass slower riders by moving into the adjacent travel lane. Making bicyclists more visible to drivers. Doors opening into the bike lanes. Not being a comfortable place to ride. Having clear and effective signage and markings. Lowering the speed limit and enforcing it. Making the bike lanes wide enough. Running an anti-dooring educational campaign. Being more predictable and easier to navigate than a two-way cycle track. The potential loss of on-street parking. Providing separate traffic lights for bicyclists. Adding left turn provisions for bicycles. Moving planters to make sure bicyclists are visible at intersections. Adding roundabouts at key intersections. Providing more separation from traffic. Providing enough room to plant trees along both sides of the street. Giving more room for bikes to maneuver. Intersections being more dangerous due to the bi-directional nature of the cycle track. Making transitions to the bi-directional lane more complicated for bicyclists. Having more landscaping in the buffer. Planting shade trees as shown in the long term image. Making the cycle track a different color. Enforcing traffic laws to prevent parking on the cycle track. Making the cycle track as wide as possible. Making sure the pavement is smooth and even. Adding bike boxes at key intersections. Maintaining the cycle track clear of debris. University Drive between Bird Road and Pisano Avenue - Due to limited right-of-way, it may be difficult to fit sidewalks and separated bikeways. One potential solution for further study could include the implementation of advisory bike lanes. 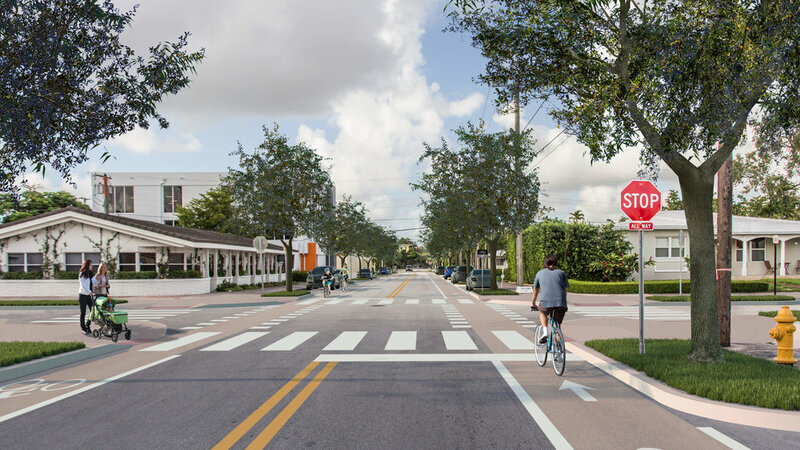 The crossing at Bird Road also presents specific challenges that should be addressed as part the Gables Greenways plan. 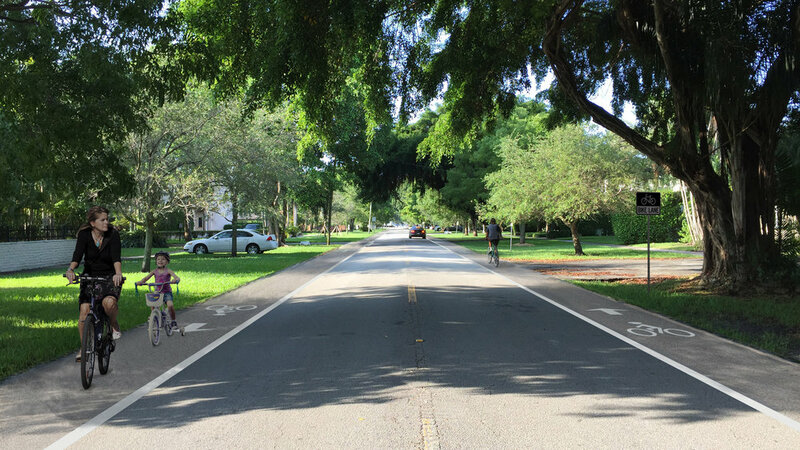 Riviera Drive between US-1 and Le Jeune Road has been removed from the Gables Greenways plan. 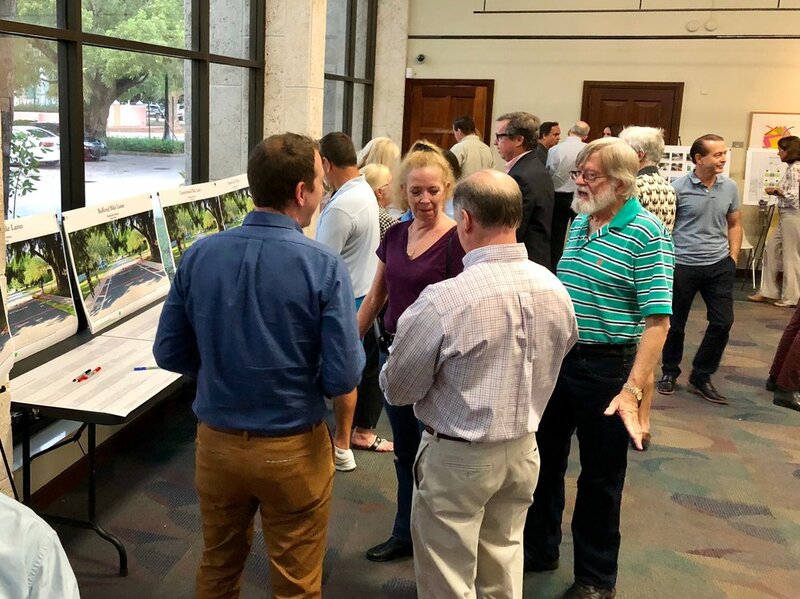 The design team is exploring the implementation of a Bicycle Boulevard on Maggiore Street. 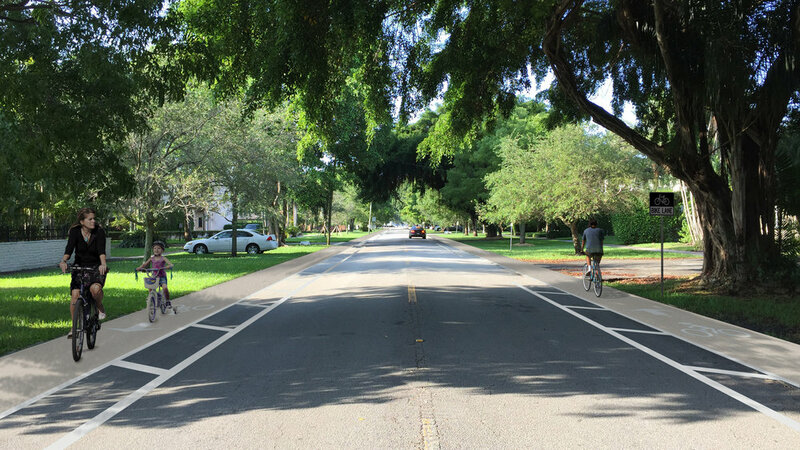 Bicycle boulevards do not provide a dedicated space for bicyclists, but instead use livability enhancements to slow down the speed of traffic, making it more comfortable to share the street space with bicyclists and pedestrians. To learn more about Bicycle Boulevards visit The Options tab. 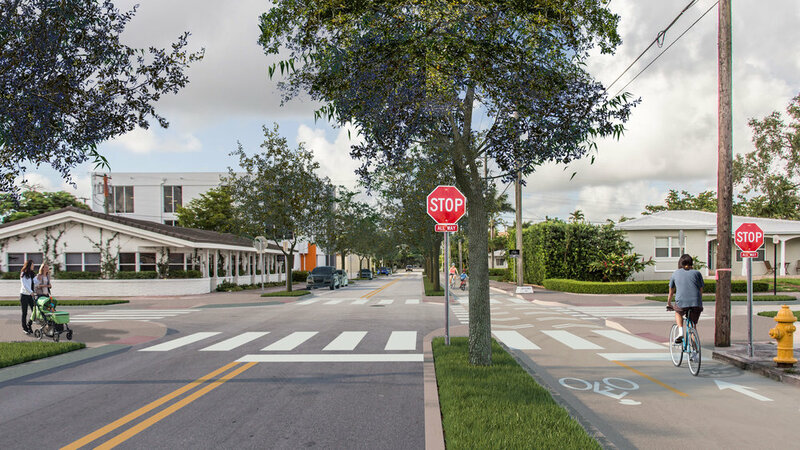 The crossing at US-1 also presents specific challenges that should be addressed as part of the Gables Greenways plan.